Earlier this year, Maine Governor Paul LePage made a stir when he -- alone among Atlantic seaboard governors and in opposition to coastal New England's entire Congressional delegation -- supported the Trump administration's draft plan to open most federal and New England waters to oil and gas exploration. At the time, I reported how he'd actually called for exactly this policy several months earlier, as chair of the Outer Continental Shelf Governors Coalition, a group of pro-drilling governors whose other members area all from states where offshore oil is already extracted. I also put in a public records request for the governor's correspondence with and for the group, which was finally fulfilled this month. In this week's Maine Sunday Telegram, I have a story on what that request revealed: that the coalition is staffed and administered by employees of a Texas energy lobbying and consulting firm. Details in the story. The lobbying firm was also active -- via the industry-funded non-profit advocacy groups it runs -- in the debate over solar power incentives in Maine and New Hampshire, and over loosening protections for New England's marine national monument. One of the great American Nations debates is whether Pittsburgh should be in the Midlands (it should!) or in Greater Appalachia (which some argue for.) For the past five years, Pittsburgh Post-Gazette staff columnist Brian O'Neill has been occasionally revisiting this question, starting in 2013, with a personal lament that I put his city in the Midlands, and again earlier this year, when he conceded the Appalachian label might not be quite right either. This week he calls in a third party perspective with this delightful conversation with a self-identified Appalachian, Eric Jester, who argues for an Appalachian identity for the city. "It's an ambitious man who defines the identity of a people who struggle [to] do so for themselves," Jester says. "The Appalachian in me loves the way a ridgeline dips into some tight little holler with a name like Scotia or Calamity; the way an orange stream dances around and under a tight winding road to the Youghiogheny; the way those fading miners' hoses sag a little in the middle." Hope you enjoy the piece as I did. For the record: I'm sticking with the Midlands, though I certainly agree that county-level resolution doesn't capture the subtleties of even first order regional cultural geography. But this placement is due to early settlement history, and to revealing events like the 1794 (Appalachian) siege of the city during the Whiskey Rebellion and not, as Jester writes, because of some "assumption that a beautiful city, a center of education and technology, and an historical hotbed of progressivism, could ever be associated with Appalachia." Greater Appalachia has a great many cities with most or all of those attributes -- Cinci, Louisville, Roanoke, Charlotte, Asheville, Winston-Salem, Nashville, Dallas, and Austin, just to name a few -- and the region pretty much gave us the "democracy" part of our liberal democracy, much to the trepidation of most of the Founders. Here in Maine, there's a four-way race to replace Governor Paul LePage, and I've been writing in-depth profiles of each of the contenders for the Maine Sunday Telegram -- pieces that ask who they are, where they came from, and what shaped their world view. 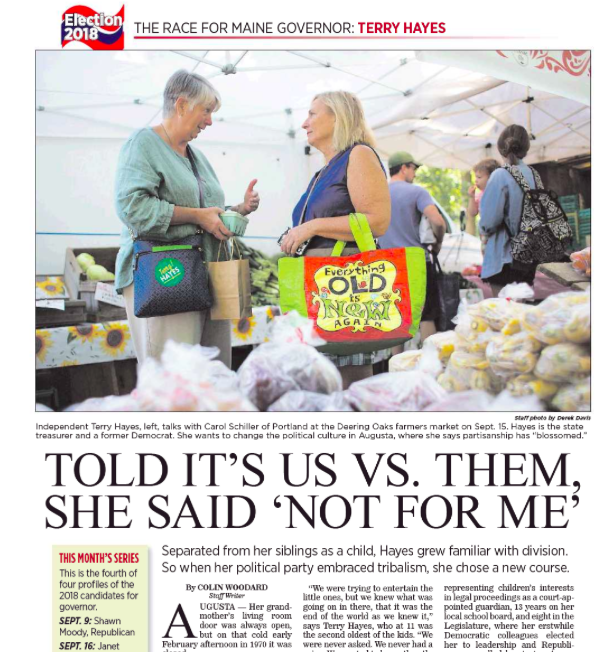 The final installment is in this week's Telegram, and is on state treasurer Terry Hayes, one of two independents in the race, who was effectively orphaned at 11, built a career in education, and served in the legislature as a Democrat before becoming state treasurer with largely Republican backing. The other stories in the series are on Democratic nominee Janet Mills; Republican nominee Shawn Moody; and independent Alan Caron. I last wrote detailed profiles of Maine statewide candidates for the Press Herald during the 2012 US Senate race, which was won by Angus King (I), currently Maine's junior senator.